Chargers RB Melvin Gordon celebrating a touchdown with his teammates. 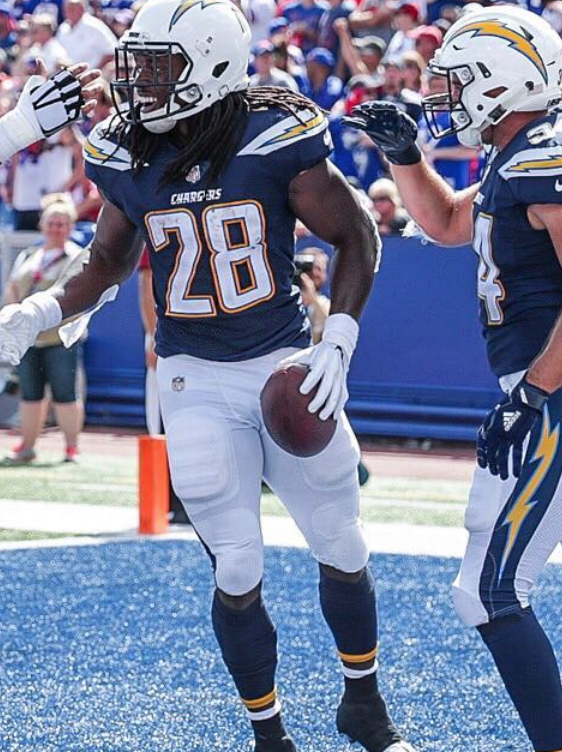 BUFFALO, NY—Melvin Gordon had a huge game as the Los Angeles Chargers defeated the Buffalo Bills 31-20 on Sunday, September 16. The win gives the Chargers a record of 1-1. It also prevents them from starting the season 0-2. The Chargers and Bills both went three and out on their first two drives. However, on Los Angeles’ second drive, they would score their first points of the game. After starting at the Bills 38 yard line, Quarterback Philip Rivers would hit a crossing for tight end Virgil Green for 25 yards. Rivers would finish the drive with a 10-yard TD to wide receiver Mike Williams for a score of 7-0. The Chargers would force the Bills to go three and out again before getting the ball back. On this drive, running backs Melvin Gordon and Austin Ekeler helped bring the offense down the field. Gordon ended the drive with a 20-yard rushing TD where he was untouched. The Bills would have the ball for the remainder of the first quarter. Rookie quarterback Josh Aleen found tight end Charles Clay for a 21-yard catch, ut, the drive sputtered for the Bills and they only scored a field goal bringing the score to 14-3. Ekeler began the next Chargers drive with runs of 22 yards and 16 yards. Gordon, once again, ended the drive with a touchdown. This time it was a 9-yard receiving touchdown from Philip Rivers bringing the Chargers to a 21-3 lead. Buffalo would go three and out on their next possession. This allowed Los Angeles to score more points before the half. Rivers led a methodical drive at the end of the second quarter, finding Melvin Gordon, and wide receivers Keenan Allen and Tyrell Williams. The Chargers essentially ended the game when Rivers found Gordon for another touchdown on 3rd and goal. The Bills would respond with a 40-yard field goal just before the halftime bringing the score to 28-6. The Chargers would score another field goal while the Bills would register two more TDs. The final score of the game was 31-20. This was a strong bounce back win for Los Angeles. The Chargers will face a test next week, when they play the Rams on the road. QB Philip Rivers (LA) was 23/27 for 256 yards and 3 TDs. RB Melvin Gordon (LA) had 9 carries for 28 yards and 1 TD. Gordon also caught 6 passes for 38 yards and 2 TDs. QB Josh Allen (BUF) was 18/33 for 245 yards with 1 TD and 2 INTs. WR Zay Jones (BUF) had 2 receptions for 63 yards. Previous articleRetired, Traveling The US, What’s Best Medicare Plan?